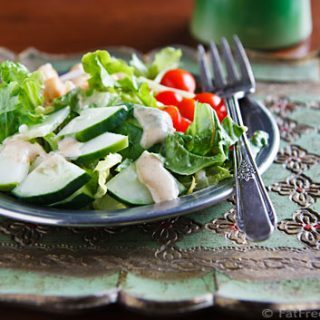 This low-fat tahini dressing is bold and spicy with a bit of a bite to it, thanks to the lemon juice, raw garlic, and ginger root. Today’s recipe is brought to you by the letter D… not D for “dressing” but D as in my husband D, who can’t get enough of this dressing. He’s been pouring it on salads and drizzling it on sandwiches ever since I made it for the first time (we’re now on our second batch). I don’t think he realizes how low fat it is because my secret ingredient (chickpeas) magically amplifies the flavor of the tahini, making it taste like it contains much more sesame paste than it really does. In his words, it’s a bold, spicy dressing with a bit of a bite to it, thanks to the lemon juice, raw garlic, and ginger root. It’s manly, yes, but I like it too! Before I get to the recipe, I wanted to point out a new feature. If you’re used to using the Recipe Index, you may notice a big change. I’ve just updated it so that each category goes to a page with thumbnail photos and short text excerpts to better help you find what you’re looking for. I hope you’ll grow to love the new look, which updates automatically whenever a new recipe is posted. 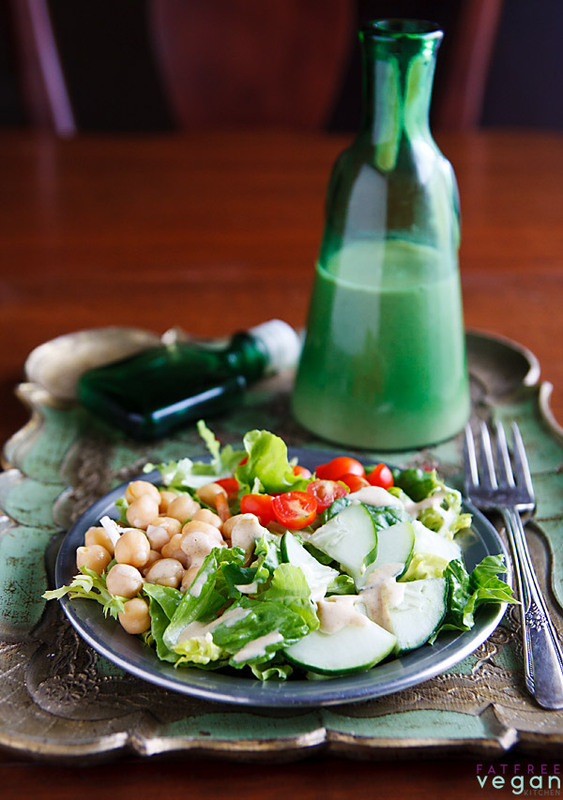 Click here to see what the Salad Dressings category looks like. This dressing will increase in flavor--especially garlic flavor--over time, so if you're not a huge garlic lover, just use one clove. Place all ingredients into blender and process on high speed until thoroughly blended. Refrigerate until well chilled. Dressing will continue to thicken while chilling. Add extra water by the teaspoon if dressing is too thick. One 2-tablespoon serving is zero Weight Watchers Smart points. Additional servings are 1 point each. Thanks, Kerri! 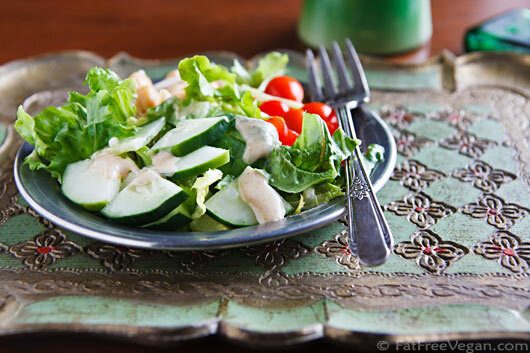 I made a ranch-like dressing using cashews that is so good. It’s like the dressing for the carrot salad recipe before this but with herbs added. You should try that one, too! Delicious! Just ate it on a huge salad with lots of farm-fresh veggies. This recipe looks outstanding!! Use of it in moderation will be a perfect addition to my ETL salads this week. Thank you, Susan! 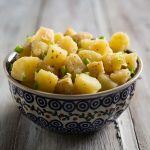 Thank you so much for this recipe, my husband, who is not a great chickpea fan, adores it and asks for it on every salad. Works great in particular on grated carots but really on any salad. I tasted the recipe and it’s good, but I tend to gravitate towards the sweeter dressings, like raspberry vinaigrette. Little tart/little sweet. So it was a little too tart for me, but it was easy to remedy. I added a little agave and YUMMO!!! Thank you for sharing so much with us. My daughter found your site and we have been using it ever since. Hi Nancy, I’m glad the site has been useful to you. I should have made it clear that the chickpeas are cooked (I actually used canned ones for this). I am just (yesterday) starting Dr. Joel Furhman’s diet (veggies, veggies, and more veggies and low fat, etc.). I am so excited to have found your blog where I can get recipes which will (hopefully) keep me motivated! 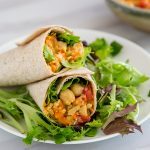 I have eaten chicken and fish, but no red meat, for years, and now am trying to go totally vegan as well as lose weight! Your blog is lovely, well-done, and I appreciate it! Thanks, Jean! Good luck with the diet! For more recipes that fit Dr. Fuhrman’s program, see my Eat to Live section. I love this dressing!!! I’ve had it bookmarked for ages – wish I’d made it sooner! Delicious on everything – salads, steamed veges, dipping sauce, in place of gravy. Yum, love it!! I just stumbled upon your blog while searching for a roasted asparagus soup recipe. I can’t wait to start trying your recipes. They sound wonderful! I was just looking at your recipe for the tahini-chickpea dressing and I thought that I would give it a try. Just wondering if I can skip the nutritional yeast. What do you think is the purpose of this ingredient and would the recipe suffer without it? Thanks for responding. I just gives the flavor a boost. It will be a little less tasty without it, but you can leave it out if you don’t have it. I love this dressing, thanks so much. I was getting tired of vinegars every day! I have a tahini question. Does it need to be refrigerated once opened? The container doesn’t say anything about how long it keeps or how to store. Thanks! Yes, to be safe always refrigerate it and any other natural nut or seed butters. On the plus side, if you stir it first, it doesn’t separate as badly. Hello! I am currently living in Costa Rica and have not found a source for nutritional yeast yet. Can I make a version of this recipe without it? If yes, would I just eliminate it, or substitute with something else? No, it’s completely different. You can usually find it in bulk in health food stores. See this post for more information: What the Heck is Nutritional Yeast? Really like this dressing. 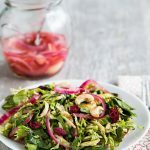 We have struggled with salad dressings with no oil and this was really, really good. Thanks for a keeper! A nutritionist on tv, not too long ago, advised against using nutritional yeast. She also advised toasting bread to kill the yeast in bread, too. It is confusing. I read your info about it. Since the two of you disagree, how is one to know if we should use the yeast or not? I would say that any time one person’s opinion is so far out there and opposed to everything that every other nutritionist says, then that opinion is suspect. There may be people for whom yeast is a problem, but they are in the minority, and to give such advice to everybody, whether they have a problem with yeast or not, is reckless. And toasting to kill the yeast? The yeast has already been killed during baking. Hi I’ve been a vegan now one month shy of a year I made the transition in steps not all at once. I believe this ensures for me my dedication to it. I started by taking a course and following a Protective Diet version that doesn’t include nuts avacados or any other oils. It was a six week course and I stayed strict to the guide lines of PD up to 6 months into it. I missed all the nuts and the avacados. That is when I came across your recipes. That was my favorite day the first thing I tried was your easy double layer cheesecake, it has been a favorite of all my family and friends. So I really just want to Thank You for posting all your recipes. Further more I realize that it takes a lot of time and dedication to do this and not get instant rewards from it. So this is one thankful admirer paying you gratitude for all your hard work, I’m really glad this is one of your passions. Again Happy Mothers Day!!! Thank you, Gisela! Hearing that my recipes are helpful to people means so much to me. 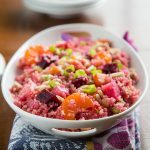 I don’t remember seeing this recipe before but it is on my list now! And I’m thinking about subbing soy milk for the water, to get more of a buttermilk style base (because of the lemon juice). It’s a high proportion of acid to milk, but I think it’s worth a try!